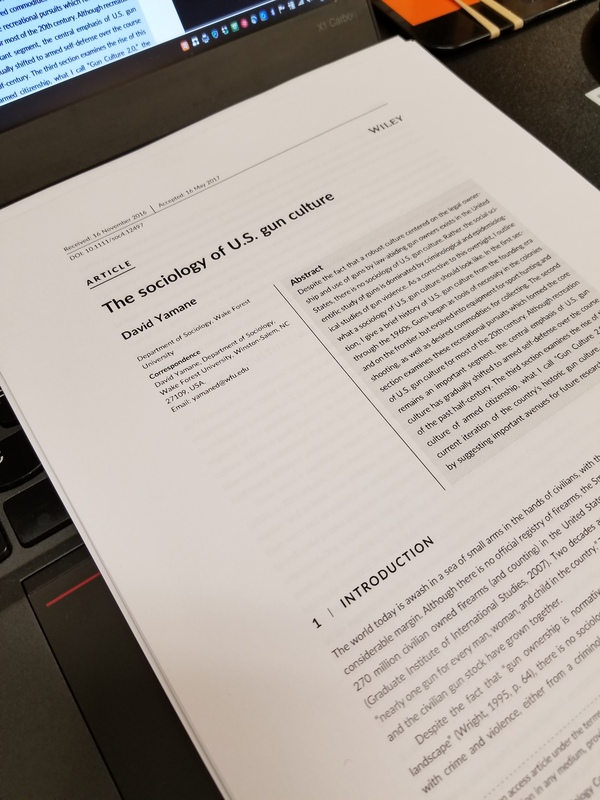 I am very happy to report that my second academic article on gun culture was published today in the journal Sociology Compass (my first was on religion and gun ownership). Thanks to a generous grant from Wake Forest University’s ZSR Library and the Office of Research & Sponsored Programs, “The Sociology of U.S. Gun Culture” is available as a free download from the journal’s website. In the paper I argue that social scientists have been so concerned with the criminology and epidemiology of guns that there is no sociology of guns, per se. To help develop a sociology of guns that is centered on the legal use of guns by lawful gun owners, I give a brief historical overview of gun culture in the United States, review the small research literature on recreational gun use, highlight the rise of Gun Culture 2.0, and offer some thoughts on directions for future research. Although the paper was written for an academic audience, if any readers of this blog have feedback I welcome it as some of these ideas are being developed for my book project on Gun Culture 2.0. Tags: Data, Sociology Compass, Sociology of Guns, Wake Forest University. Bookmark the permalink. A big thank you to the sponsors making this freely available. I hope talking about the anti-gun ‘culture’ and what makes them tick will make into your book or the book after that. Honestly, there is more material on gun culture itself than I can handle so don’t see myself going down that path even after the first book. Having grown up in an anti-gun blue bubble, I believe the root of anti-gun culture is people only associating negative outcomes with them and not attributing any positive outcomes to them. They simply have no use for guns at the end of the day. I mean, there’s more to it than that, but not enough to motivate my interest alas. I don’t think there is an “anti-gun” *culture* per se. There is a *movement* comprised of a very few, many rich, anti-gun elements who bankroll anti-gun politics, science, and media coverage. A bunch of politicians (some bankrolled) who use it as a wedge issue, some scientists (some bankrolled) who seem to operate via bias rather than sound science, and a huge amount of media (usually saps) who are politically and culturally sympathetic to them in their reports on guns. Coupled with them are the vocal but not numerous, usual suspect (some few bankrolled) activists who flock to such wedge issues for partisan reasons. The majority that might be called “anti” are the large number of Americans who are, as David notes, not so much “against” as disinterested, but with a generally negative viewpoint due to the actions of the above and no positive personal references to counter them. That’s where we need to counter. We are not going to beat the deluded, mendacious, nor evil at their own games. We can only win at the personal level, by making our side appear to be what it is, reasonable and rational. Since most of those not “for” us aren’t actively “against” us either, we just need to move them to neutral or slightly positive and our greater number of actively “for” can win politically. I think to many who don’t have guns, there is little benefit in the cost/benefit equation to private ownership of guns. If guns were only out in the country and involved in gunsport there would be less anxiety (unless one opposed hunting on animal rights grounds). But as David says, those who are not involved with guns see only the costs of misuse, i.e., murder, suicide, armed assault, armed robbery, a deeply conservative gun culture they can’t stand, etc. So to those who are not fond of guns, if there are obvious costs but few obvious tangible benefits to guns, why not get rid of them? I’ve often used the same argument about putting tighter restrictions on car use in a way analogous to many European nations using the Vision Zero concept, but few, other than some advocates and traffic engineers, see the parallels. Unfettered car ownership causes a similar number of deaths, injuries, and monetary losses as guns. What cars do for people, regardless of their political point of view, is provide unfettered mobility in a society that has developed around the car as the principle implement of mobility. Hence the free exercise of mobility justifies the carnage. Or as I like to say, “you won’t take away my car keys until you pry them from my cold, dead hands.”. If anyone reading this has had to take the keys away from an elderly loved one, you know what I mean. Really interesting comparison and thought experiment. Social problems are “socially constructed ” as we sociologists say. How the problem is defined affects the range of logical solutions to the problem, as you highlight very well. A needed entry for the field. Some brief thoughts for book. There’s a bit of contradiction between US being unique in gun culture yet ours being shaped by existing transplant shooting cultures from Europe. Anecdotes like the James/Younger Northfield raid being opposed by a target shooting Swede(?). Those cultures still exist in Europe. Maybe contrast what in their culture differed that ours retained more political pull? I got into a bit of a tiff recently with a historian on Twitter who wrote an article stating, essentially, that allowing carry by Congress today would be bad due to the violence within Congress in the mid 19thC. Aside from the reality of Congressional security (I don’t think they get searched even today, so there likely are/have been Sens/Reps carrying since forever), I pointed out how the massive societal changes in our “honor culture” and social acceptance of dueling and the like make such a comparison at best facile. As it comes to the imposition of laws against carry and their revocation, and the social acceptability of publicly acknowledged gun ownership, perhaps a sociologist can look at those factors in a way a historian didn’t think to consider. Also came to mind that media would be worth looking at. Not specifically from a content viewpoint, “it bleeds it leads” goes back to the dawn of time it seems, nor from a political affiliation, though the polarization of media into the “Left” bears on it. Rather the apparent increasing divide between urban/rural etc that leaves many urban press with outsized cultural impact but decreased participation in the parts of culture that sustain GC 1.0 or 2.0. They literally can’t reflect either properly as they aren’t and haven’t been members recently to any degree.